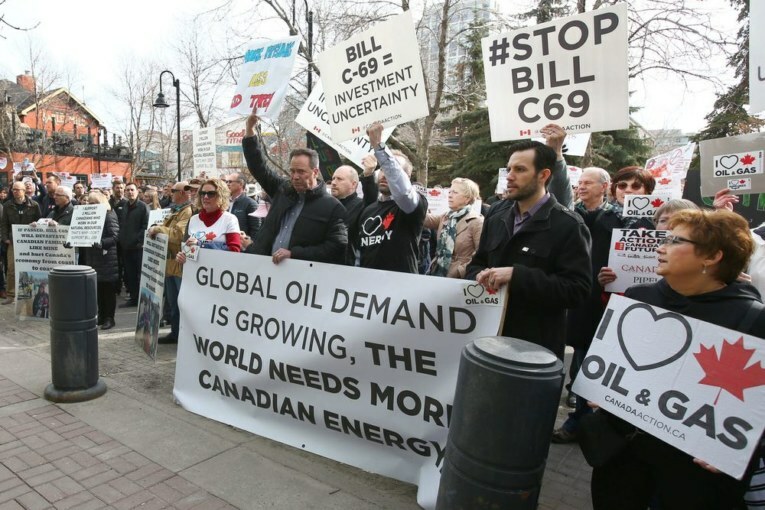 During one chaotic two-hour span, a parade of senior oilpatch and pipeline executives appeared before Senate hearings in a downtown hotel, sounding the alarm that federal Bill C-69 will stop future energy projects from being built. Just a few minutes later, several hundred noisy Calgarians congregated out front of the hotel, chanting “build that pipe,” their voices ringing throughout the lobby. In the midst of the gathering, UCP Leader Jason Kenney appeared and jumped on his pickup truck, grabbed a bullhorn, and launched a verbal broadside against federal Liberal energy policies, vowing to launch a constitutional challenge of Bill C-69 if he wins next week’s provincial election. It’s only one day and one snapshot in time, but the scene captured the anxiety and anger smouldering throughout Alberta’s energy sector and parts of the province. People aren’t just worried. They’re furious. “Suddenly, it’s just one straw too many,” said Senator Doug Black, a Calgarian who has raised concerns about both pieces of federal legislation. Bill C-69 will overhaul the way Ottawa assesses and reviews major energy projects, including pipelines. It has become a lightning rod for Alberta’s discontentment toward federal energy policies proposed by the Trudeau government. Bill C-48 will block oil tankers moving off northern B.C. coastal waters, a ban that doesn’t extend to LNG tankers, or foreign oil that comes in along the Atlantic coast. At hearings in Calgary by the Senate’s standing committee on energy, the environment and natural resources, several oilpatch executives pointed out the sector has already seen billions of dollars of investment flee this country. Canadian pipeline operators are increasingly looking south to build new projects, while drilling rigs are heading into the U.S. to find work. It’s worth remembering Bill C-69 has not yet come into effect. But other federal decisions and muddled messages around energy developments can’t be overlooked. The Northern Gateway pipeline project was effectively torpedoed by the tanker ban, while TransCanada pulled the pin on its Energy East development, which would have moved western Canadian crude to the Atlantic coast. TransCanada senior vice-president Patrick Keys told the hearings the company doesn’t see how any new major linear energy infrastructure can move forward with some of the provisions in C-69. With Energy East, Keys noted the company filed an initial application with the National Energy Board in October 2014. Three years later, the project was still mired in the initial stages of a slow-motion review. And the Trudeau government neatly expanded the scope of the assessment to include a “never-before-imposed requirement” to assess upstream and downstream greenhouse gas emissions tied to the project. Despite having sunk $1 billion into developing Energy East, the company walked away. “Regulatory uncertainty, lack of clarity and changing expectations, such as we experienced on Energy East, is like poison to those who are considering whether or where to invest billions of dollars,” Keys said in his prepared statement. He wasn’t the only executive with a tough message. During his presentation to a packed room, Pembina Pipeline CEO Mick Dilger delivered a sombre assessment of Canada’s energy challenges in 2019. The value of Canadian oil and gas companies has dropped almost 50 per cent since 2014, while more than $30 billion in energy infrastructure investment has been cancelled. Dilger believes the ongoing policy uncertainty favours foreign-produced oil entering Canada because energy firms in other countries don’t face the same environmental standards or constraints to get their product into the market. “The ripple effect of losing hydrocarbon investment . . . is going to be dramatic. Balance sheets are stressed and weakening and people are hanging on now,” he added. Similarly, several petroleum producers warned about a flight of capital as a major consequence of the bill, which can still be amended. “With Bill C-69, basically you are going to stymie all projects, there will be no investments, very little jobs created,” said Steve Laut, executive vice-chairman of Canadian Natural Resources, the country’s largest petroleum producer. Hopefully, these messages won’t fall on deaf ears in Ottawa. Many complex forces, from weak commodity prices and technological advancements to the meteoric rise of U.S. energy production, are causing a dramatic realignment in global energy markets. But regulatory ambiguity and constant delays are only making matters worse for Canada. More than 40,000 oilpatch positions have been lost since 2014. People without jobs are hurting, and many Albertans are simply fed up. “This is ground zero of the pain,” Rick Peterson, president of advisory firm Peterson Capital and founder of pro-resource group Suits and Boots, told the committee.